One of the most practical reasons to learn Chinese is for work and business. Knowing Chinese as a second language opens new doors of opportunity, and increases your hireability to employers. If you’re new to learning business Chinese, FluentU has many quick-start guides. For example, if you’re a business consultant, you’ll want to learn the vocabulary specific to your industry. If you’re in human resources, FluentU has a great resource on the Chinese names of titles and positions within a company. For fluent email communication, be sure to check out the essential communication vocabulary and email lingo. See also our list of Chinese names of foreign companies, and for inspiration on learning business Chinese, don’t forget to check out Mark Zuckerberg’s (Facebook CEO) Chinese learning journey! Why Should I Learn Business Chinese? 1.2 billion people speak Chinese (848 million people speak Mandarin Chinese), according to Ethnologue, making Chinese the most widely spoken language in the world. Next to English, Mandarin is the top business language, according to Bloomberg Business Rankings. Knowing a second language can increase your earning potential by as much as 10-15%, according to Ryan McMunn, President of Asian Operations at a leading U.S. manufacturing firm. Understanding the advantage of Chinese fluency, many families go to great lengths to help their children learn Chinese, including taking their kids to China for language immersion, enrolling them in language immersion schools and hiring Chinese tutors and Chinese nannies. In addition to learning the language, one useful piece of knowledge to have under your belt is the how the dynamics of business relationships, or 关系 (guān xì), work. Chinese business and work culture revolves around relationships, and you cannot do business well with someone without having a good relationship. In China, relationships can open doors, as well as get you hired or promoted. The importance of relationships is why Chinese spend a lot of time having business get-togethers, such as eating together at restaurants, going to clubs and bars, traveling and playing golf with business associates. These business social gatherings, called 应酬 (yīng chóu), are often a necessity because of the importance of relationships. Although learning business Chinese may seem daunting, as the Chinese proverb says, a journey of a thousand miles begins with a single step, or 千里之行，始於足下 (qiān lǐ zhī xíng shǐ yú zú xià). To give you a small, single step, below are 26 work-related Chinese vocabulary words to get you started. Beyond the vocabulary presented below, FluentU is one of the best tools to guide you on this language learning journey. Whatever stage of learning you’re at, FluentU has the curriculum and study aids to take you to the next level. Using this tool will help you learn and reinforce the vocabulary below and more. Real-world Content. FluentU offers real-world video content, such as TV interviews, TV dramas, movie clips, commercials and music videos. That means the language is authentic and used by today’s native speakers (unlike the made-up conversations found in many textbook). 200+ Videos for Business Chinese. FluentU has a collection of 200+ videos with business-related content, including a conversation on “Arriving for an Interview,” a talk on “Three Things I Learned from Bill Gates” and a series called “Interview Go!” that covers common interview questions and answers, among other need-to-know elements of interviews. HSK Standard Vocabulary Flashcards. 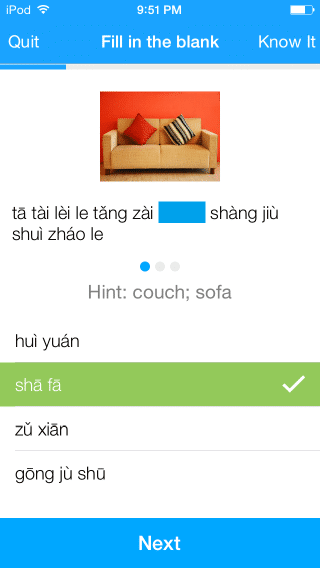 FluentU’s virtual flashcards are sorted by subject and by HSK Levels. HSK Levels 1 to 6 represent the standard Chinese proficiency exams. Studying through each numbered level can ensure that you master all the standard vocabulary required at each level of fluency. FluentU App for Learning on the Go. FluentU’s language learning app suits your busy lifestyle. Maximize your time by learning Chinese while commuting, while waiting in line, during work breaks or while working out. I just got a new job (work). I start work every day at 9 AM. Usually I get off at 5 PM. During the busy season, I need to work overtime. Our office is in a tall building downtown. We also have several factories in Shenzhen. At the end of the year, I will go on a business trip to Beijing. Mr. Huang is our boss. Mr. Huang is also the CEO. Mr. Wong, our manager, has many years of work experience. Our company has over 400 employees. Our clients are mainly foreigners. When I get to work, the first thing I do is turn on the computer. Every day, I receive many emails. Did you get the document I sent you? Do you know how to use the photocopier? I have a meeting at 2 PM with Ms. Wu. We discussed business in a restaurant. We finally closed the business deal. My coworkers and I need to manage some problems. Our accounting department is very strict. I used to work in Human Resources. Our IT department is very efficient. The marketing department needs our product photos. Now that you’ve masted these 26 basic business Chinese vocabulary, don’t forget to head over to FluentU to extend your learning experience. 5 Surprisingly Simple Ways to Get In Your Chinese Reading Practice Online!